The Ospreys travel to Cardiff on Saturday evening for an intriguing clash of the Welsh regions ahead of the November internationals. They've had differing starts to the Magners League with the Ospreys in third and Blues in eighth so the match would be important in it's own right, but with Warren Gatland picking his squad in the coming weeks it gives an opportunity for Wales' finest to showcase their wares. Both sides had solid starts to the Heineken Cup in the last two weeks with the Blues narrowly losing out to Sale last Sunday after their opening day win over Harlequins. The Ospreys meanwhile will be boosted by their spectacular draw against Leicester Tigers and win over Clermont Auvergne that leaves them in good stead in Pool 3. There had been calls for Shane Williams to start at scrum-half with the absence of Mike Phillips, James Nutbrown and Tom Isaacs, but Scott Johnson has named Rhodri Wells at No. 9. Lee Byrne, Adam Jones, Ian Evans and Conor McInerney remain out for the injury hit squad, Tom Smith celebrates his new contract by starting ahead of Ryan Jones in the back-row alongside Jerry Collins and Steve Tandy. They'll be looking to address their second half performances after giving up big leads in both of their Heineken Cup wins. They were 18 points up on Leicester who fought back to draw, while Clermont came up just short after coming back from 19 points down only for the Welsh side to cling on. But having won all four of their last meetings against Welsh sides the Ospreys will be confident of victory. Martyn Williams returns to the Cardiff line-up alongside Xavier Rush who replaces Andy Powell who is stricken with the same flu that ruled Rush out last week. Bradley Davies and Gareth Thomas will have to wait another week for their returns against Leinster, while Paul Tito is fit enough for the bench. For winger Leigh Halfpenny it's an opportunity to show his former club what he can do and he's relishing the opportunity. "I feel coming here to the Blues has given me plenty of motivation to prove people were wrong about me and, every game, I keep trying to do that," he told The Western Mail. "It's going to be exciting playing against my mates from there and, hopefully, playing well for the Blues." 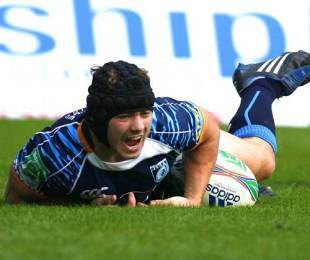 "The Ospreys seem to get off to a flying start in games. We need to take the Ospreys' starts into consideration. During the opening 20 minutes we have to concentrate to make sure they don't get another flying start. We've got to get control of the game and, hopefully, be able to kick on in the second half." Cardiff Blues: Ben Blair; Leigh Halfpenny, Tom Shanklin, Jamie Roberts, Tom James; Sam Norton-Knight, Gareth Cooper; Gethin Jenkins, Gareth Williams, Taufa'ao Filise; Deiniol Jones, Scott Morgan; Sam Warburton, Martyn Williams, Xavier Rush. Ospreys: Barry Davies; Tommy Bowe, Sonny Parker, Andrew Bishop, Shane Williams; Dan Biggar, Rhodri Wells; Duncan Jones, Richard Hibbard, Cai Griffiths; Ian Gough, Alun-wyn Jones; Jerry Collins, Steve Tandy, Tom Smith. Replacements: Ed Shervington, Paul James, Jonathan Thomas, Filo Tiatia, Ryan Jones, James Hook, Nikki Walker.